Althea Giveaway: Pobling Pore Sonic Cleanser! 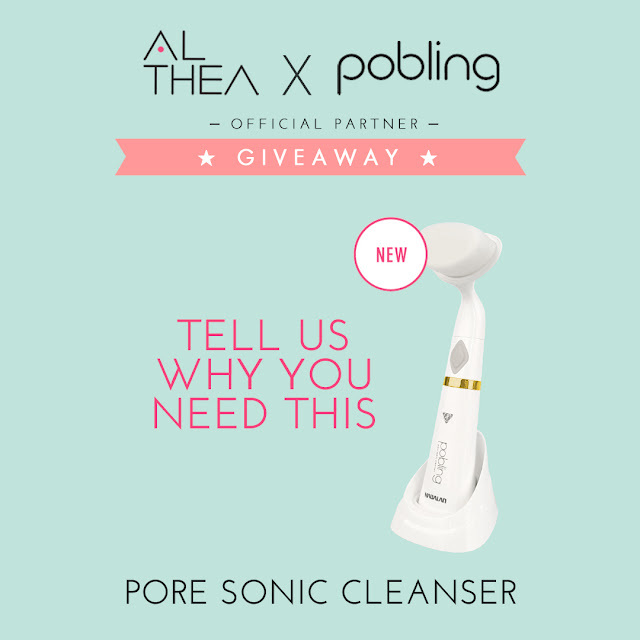 Make at least 5 minutes video on why you need the Pobling Pore Sonic Cleanser, and upload it online on any video platform e.g Youtube/Blog. Submit the link along with your details (name, e-mail, and your country) through Facebook message. You can be creative, funny, or interesting as long you tell us why you need it! 2. Open to all Althea account members in Malaysia, Singapore and Philippines. 3. Late and incomplete entries or otherwise not in accordance with these terms and conditions will be void. Entries made through agents, third parties, organised groups or any entry duplication method will not be accepted. 4. Judges decision is final. 5. Unless otherwise stated, the winner(s) must claim their prize(s) within 14 days of notification. If they do not do so, then Althea reserves the right to offer the prize to an alternative winner selected in accordance with these terms and conditions. 6. The prize(s) cannot be converted into cash, is not transferable to other persons or organisations and is not exchangeable for other goods and service. 7. Althea has the right to publish or display the submitted video and participant details on printed or electronic media for promotional purpose. 8. Entry implies acceptance of these terms and conditions and all entrants agree that their personal data will be used by Althea the sole purpose of administering this contest. 9. This contest is not affiliated or run by Facebook.